I’m a stay-at-home Melbourne mum of four young children under 8 and my two youngest boys have Autism. I am also the creator of Hope Toys. Early last year, I was inspired by a lady in Tasmania, who recycles, repairs and up-cycles second hand dolls, swapping the glitzy high-maintenance look for a down-to-earth style. 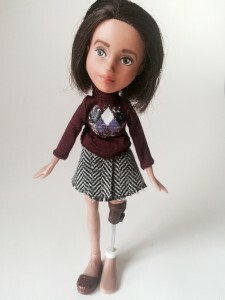 I immediately fell in love with this idea, but instead I wanted to make dolls representing children with disabilities, illnesses, limb differences and any other visible or non-visible conditions, because it’s something I’m very passionate about. I never thought doing something like this would ever be possible, until I discovered this form of up-cycling. I also make wheelchairs, walkers and other medical accessories to go with the dolls. I LOVE seeing the children’s faces when they receive their dolls for the first time. It’s like I’m watching my own children. Knowing these dolls have made a positive difference in their self-esteem, is priceless. It just keeps me focused and motivated to keep doing what I’m doing. The biggest challenge is finding the time to make these dolls while balancing family life. I am on the go all the time and usually only find time to work on these dolls in the evening when my kids have gone to bed. It can often be overwhelming at times but, every now and then, someone tells me how much these dolls have touched their hearts, and that helps keep me going. Hope Toys makes absolutely no profit on any of the dolls because it’s more of an awareness mission for me rather than a business. I charge less than what they cost to make, because I want them to be as affordable as possible for ALL children. The money goes straight back into materials. Half of the dolls I make are for seriously ill children and I make those for free. The only catch is the long wait time as I am a one woman/mum show. I don’t know how long I can sustain this, but God willing, I will keep doing it for as long as I can. Hope Toys is also about using these dolls to help raise awareness of various disabilities, rare illnesses, cancer, limb differences and other conditions, to hopefully help remove the stigma of the many often misunderstood conditions people live with. Once I finish a doll, I share photos of them on social media and often a photo of the child with their doll and include information in the post about the specific disability or condition. I also often put links to fundraising, awareness, support and charity sites connected to the particular condition. It has been such an eye opening experience for me because I have learnt so much in the past year. As a special needs mum, I know how frustrating it can be when my son’s Autism can often be misunderstood and mistaken for bad behaviour. I think public awareness and understanding is very important. I also hope these dolls can give toy manufacturers a ‘bit of a nudge’ to shift their thinking and expand on the range of dolls they produce and to see just how important it is for a child to see themselves through dolls and toys. One mum told me that her daughter (who has Cerebral Palsy) received the doll when she was on her way to the hospital to do a routine medical examination. Her daughter was feeling very anxious about the medical appointment but once she had her doll she was filled with excitement and even pretended to do what the doctors were doing to her on the doll. Her mother was just so relieved and thankful that this doll bought so much joy to her daughter at a time that she otherwise would have dreaded. This is what I’d love the big manufacturers to see. 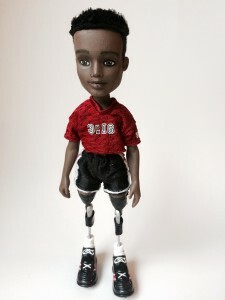 Even if they think all inclusive dolls like these attract a smaller market, the most important thing to know is that these dolls make a positive difference in children’s lives. At the moment, I have temporarily put requests on hold until I can complete the backlog of requests, however anyone is free to contact me to put their request on a waiting list.